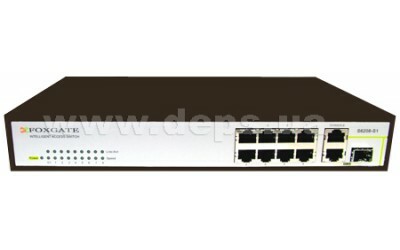 Managed L2 switch FoxGate S6208-S1 with 8-port 10/100 Mbps Ethernet port and one Combined SFP / GE connection to the backbone. Supported protocols: STP, RSTP (802.1w) and 802.3ad. which provide efficient and reliable operation in today's distributed Ethernet-networks. Switch FoxGate 6208-S1 has advanced features for working with IP multicast, such as: IGMP Snooping, L2 Querier, support multicast VLAN and SCM (security control multicast), which ultimately makes this switch ideal tool for working with IP Multicast streams.